Thesis Invited For Publication in IJAR!!! 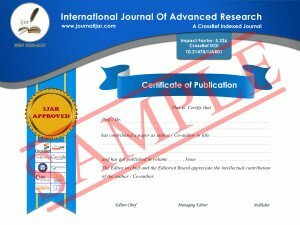 IJAR offers thesis publication services to give authors/ doctoral students a global and wide platform to showcase their valuable work. Whether it is a master’s dissertation, M. Phil dissertation or a doctoral thesis, these are grey literature that is not widely accessible. 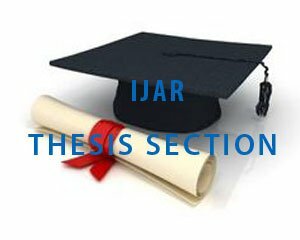 But, with the help of IJAR, the research and findings of thesis will have a worldwide visibility and can greatly contribute to their respective fields of creativity. If you’re about to finish your Ph. D. thesis and want to get your work to be globally known, then option for our thesis publication services and get your work recognized by one and all. Moreover, the authors hold full ownership of the completed work and are entitled to sell or distribute copies of the book. IJAR feels happy to mention here that for every author whose thesis is published, a permanent link/ page will be created on our website with his name and full bio data. Moreover, after publication, authors will have access to make suitable changes in their respective webpage. IJAR Journal/ publication is open access, which means that your thesis is available to anyone in the world to download / read for free directly from the website. Your thesis will be accessible from Google Scholar and Google via Title/ Author name etc. Click here to check the list of Thesis Published in 2018.